David Hare’s plays always seek to provoke one’s mind of current issues such as inequality, social deprivation and most particularly the politics of the changing state of the Labour Party – and his most recent play showing at the National Theatre does just this. It focuses on NHS and funding, creating a meaningful story into how lives, both politically and personally are affected by the current health policies. 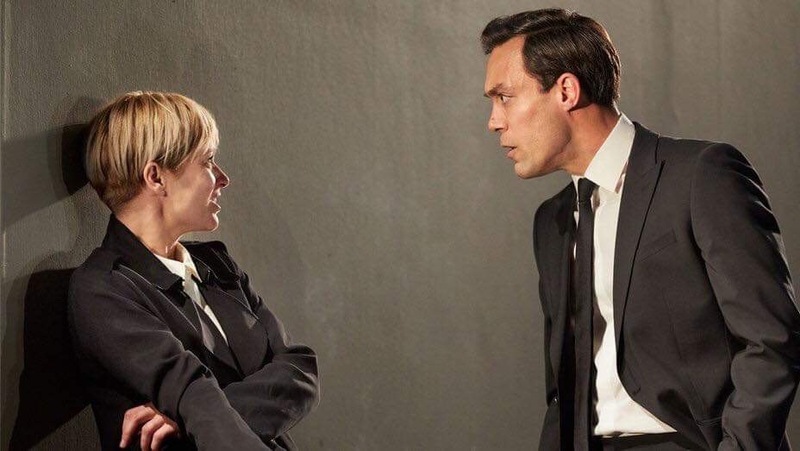 Hare uses two main characters, Pauline Gibson (Sian Brooke) and Jack Gould (Alex Hassell) to portray these issues in a narrative that intertwines both their political and personal beliefs. Pauline, a confident, motivated individual is an NHS doctor who campaigns to save a hospital in Corby arguing that smaller, local hospitals are crucial to people’s lives and will have a literal life-threatening impact if they are shut down. Jack, however, who also becomes a national icon as a candidate to lead the Labour Party, argues that more funding needs to go to larger hospitals and therefore rejects Gibson’s argument. The audience are meandered through Pauline’s life where we are taken back in time on a number of occasions to truly understand the two character’s differing perspectives and how their experiences have shaped their political beliefs to this day. The narrative is centered around whether Pauline will run for the Labour Party against Jack, which try’s to keep the audience guessing but this strand of the story isn’t gripping enough – in fact, the reasons behind and the shaping of Pauline and Jack’s purpose to run are a lot more engaging. Sian Brooke delivers an excellent account of a confident but troubled woman, who’s more vulnerable than she lets on. She expresses the fragility of her character as well as making a smooth comparison between Gibson’s younger and current self. There are, however, various scenes that are too long with pauses often feeling awkward to be a part of. Shouting matches tend to blur the underlying meaning of this play which sometimes can feel more like an episode of Eastenders than passionately developing the storyline by which Hare seeks to promote. Scenes are placed well when reflecting back through the years. The central section of the stage is used to create an intimate setting where the untangling of these two confident characters can be well depicted. Overall the premise of the play is an interesting one; it’s thought-provoking and inspiring leaving you with that feeling of wanting to do more for a cause. However, some of the narrative and overly long scenes often feel draining at times. The narrative itself gets close to creating momentum but just misses the mark and dwindles. Ironic – Labour is all about gaining momentum, I’m not sure that this play will quite get the audience’s vote – this doesn’t necessarily mean it isn’t onto something though.